Match that has been waited for past 50 days, and surging past tiresome 73 games, finally here is the final’s – Chennai taking on their close neighbours Bangalore. Dhoni could do no wrong on this day as he won the coin and straight away decided to Bat first on a track which looked to slow down in the later of the innings. Hussey and Vijay proved how crucial the decision was, as both of them took RCB’s bowling apart, esp Vijay was merciless when ball was pitched in his arc of swinging arm. Balls touched crowd more often than the boundary lines. Both these players not only found boundaries, a point worth a mentioning is running between the wicket, i am damn sure, CSK would have stole minimum of 25 to 30 runs, with quick running between them. These two have been a example for the players watching throughout the world. Both Players got of to the fifties, Vijay being the first followed slowly by Hussey. After a record opening partnership stands between them, Hussey departed for well made 63 runs. Dhoni came in two hits to ground and he was gone, Murali Vijay finally got himself out, after a tiresome innings of 95 of 52 balls. Bravo and Raina hat their point to say with their six over the bowlers to finish Chennai with mammoth 205/5 in 20 overs. GUMMTAKALAI GUMMAVA, ENGA CHENNAINA CHUMMAVA…. CHENNAI SUPER KINGSKU ORU PERIYA WHISLE PODU MAMU…. CSK 205/5 in 20 overs. RCB 147/8 in 20 overs. – CSK became the first team to play with the unchanged team for 6 games on a trot, highest ever by any team in IPL so far. – Fastest fifty for CSK came in the finals as Chennai scored the 50 in 31 balls, this just second time in this series, they have went past fifty in the first 6 powerplay overs. – First four of the match came after 47 balls from the bat of Hussey, but CSK have already scored 4 sixes. – Vijay’s Fifty of 29 balls is the second fastest fifty by a CSK player. 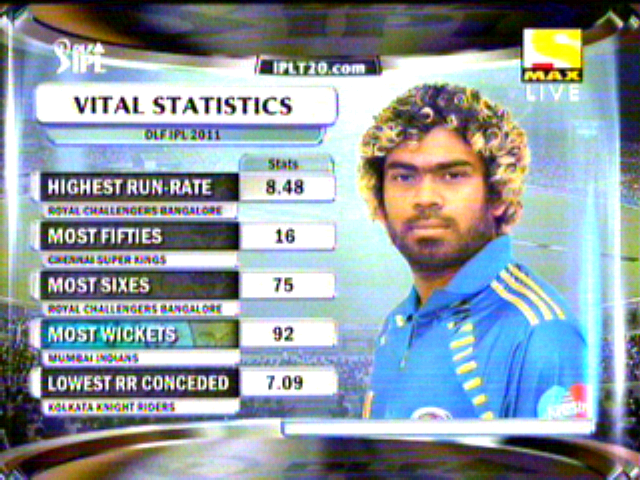 – 100 runs in 10.3 overs, is the fastest by CSK for this season. – 159 runs partnership between Mike hussy and Murali Vijay is the highest ever for CSK in the IPL History, bettering 106 Vs RCB in the second season of IPL. – 159 runs between Vijay and Hussey is also the highest over opening stand in the all the season’s of IPL, previous was 155* runs between Gilchrist and Laxman Vs Mumabi in the first season. – 205/5 is the highest score by any team in an IPL final, 168/5 is the previous best by the same team Chennai Super Kings. – Vettori gave 34 runs in his 4 overs, without a wicket, it’s just the second instance , Vettori has gone past 30 runs in this season and both time it was against CSK, last time he was taken for 42 in his 4 overs. – Gayle Picked up his Second duck of this season, last duck came in 7 balls, this time in 3 balls. – Murali Vijay scored the 1900th Boundary of the tournament. – Scott Styris is the only person in Chennai Squad who has won the Title with Deccan’s earlier and this time with CSK. – Chennai Super Kings won all the games played in their Home Ground Chennai Chepauk, Stat says 8 out of 8 for this season and overall 18 games out of 25 played. – Vijay’s 95 and Hussey’s 63 are the two highest scores in an IPL final. The previous-highest was also by a Chennai batsman – Suresh Raina’s unbeaten 57 against Mumbai last year. Vijay’s 95 is also his second-highest in all IPLs, next only to his 127 against Rajasthan last year. – This is the first time in an IPL final we don’t have a maiden bowled, on the other three occasions, it was, Makaya Nitini in the first, Ryan Harris in the Second, and Ashwin the third. Citibank Rising star of the Tournament – Iqbal Abdulla of KKR. After losing the first chance to be in the finals, New format gave RCB a one more shot at the cherry to be in the finals, after Mumbai winning over the KKR, they are set to face RCB to be in Finals against Chennai Super Kings. Sachin won the toss and wanted to field first, on a pitch which looked to favour more for batsmen than the bowlers. Seemed a bad choice and one man who decimated throughout the tournament and a nemesis for bowlers CHRIS GAYLE, turned hot once again. GAYLESTROM struck the Chepauk and Mumbai, Hopeless Mumbai dropped the chances came their way to add salt in wound. Gayle and Agarwal went on to add 113 runs for the first wicket in just 10.4 overs and finally Mumbai Indians held a catch to send Agarwal on the way back on 41 runs. Gayle smashed few more volley’s before getting out to 89 runs. RCB failed to accelerate once Gayle was dismissed, as they scored just 37 runs in 32 balls, which gave Mumbai a slight hope to come and chase 185 runs scored by RCB. RCB 185/4 in 20 overs. MI 142/8 in 20 overs. – Chris Gayle became the first player in any tournament to win 6 Man of the Match awards. 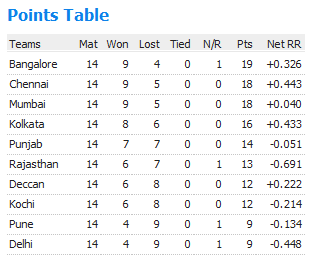 – RCB qualify for the finals for the second time in the IPL. – Its second time in IPL, that South Indian teams will battle out for the title, previous time was in 2009, as Deccan’s faced Bangalore. – Any one south team has been a part in the all the four finals of IPL so far, three times its extreme end of south, Men in Yellow. 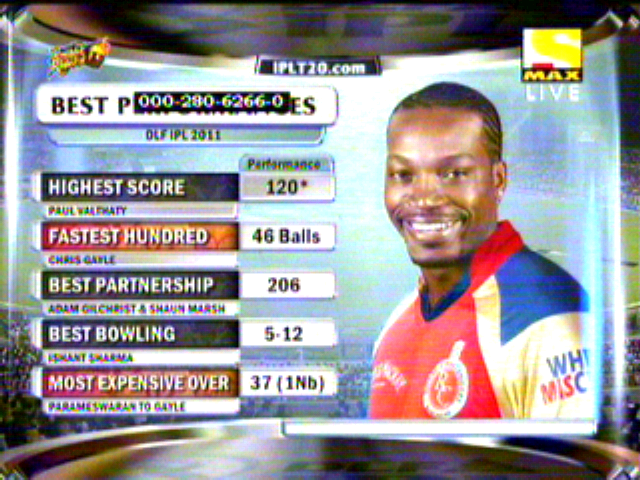 – Chris Gayle scored his 3rd Fifty of this tournament, along with his 2 big Hundreds. A battle of Do or Die for both teams, as the game is named as ELIMINATOR, some kind of wrestling game. Both the teams who played couple of days earlier, so they very know about each others. Sachin who won the toss felt its better to chase just like the old times. Munaf responded very briskly to his call, as he chipped in with quick wickets to put KKR 20/4 in 6 overs. Its time for Ten Doeschate and Yusuf Pathan to build the innings with out losing any more wickets, which meant pathan wasn’t himself, restricted himself in many occasions even when the ball is tossed up and width was given on offerings. After his departure, Shakib joined the Neterlandian and continued the journey, Finally with the fab knock form Ten Doeschate meant KKR 147/7 in their 20 overs. – Sachin Tendulkar is third in the highest run getter’s list with 513 runs. – Both Ryan Ten Doeschate and Andy Blizzard scored their Maiden IPL fifty. – Mumbai Indians qualify for the Champions league 2 years in a row just like the other two teams who have already qualified for Champions League. A Game you can remember ever if your a ardent T20 cricket fan irrespective of which team your supporting. you will be rejoiced if you were supporting the men in yellow to win the match, as they emerged triumphant with a never die attitude and to go straight into finals for the third time in the IPL history. Dhoni won the toss and decided to field first, how often you see Dhoni wants to chase especially in a T20 game, it was that kind of the day, May be Gayle would have made the change in the mind of Dhoni. However, things started well, as usual Ashwin struck as soon as he was hit for six, this time a Undertaker’s sign to finish off Chris Gayle, when he was trapped in front of the wicket attempting a sweep. Even though Gayle went so early Kohli along with Manish Agarwal and Luke Pomerbach did the repair to restore RCB back in track, as well late on slaughter from Kohli ensured RCB went past 150 easily and they ended up 175/4 in 20 overs. Disastrous start you could ever ask for, as Hussey dismissed in the very first over for a duck, followed by Vijay with a rare Taufel’s wrong decision to pavilion and scorecard read 7/2 in 2 overs. Both batsmen in the crease very well know they can’t lose another wicket in hurry and end up just like in the last match, so both Raina and Badri kept the plan simple to rotate strike till the iron is hot enough to strike. Just before that Badri was dismissed for well made 34. Finally the time for killer blow came in the over of Abimanyu Mithun both Dhoni and Raina looted 23 runs to give a kick start for dying CSK, But this guy from Caribbean, still wanted to fight back but this time with balls in his hands, he was firing in yorkers, sliders, short jab balls, none seems to connect s he kept the run rate for CSK in the check all the time till finished off in 18th over. u need other bowlers to support Gayle,but it wasn’t happening as Raina took Zaheer’s 17th over for 20 runs but he still got the wicket of Skipper Dhoni, but irony is that it brought none other than Morkel to crease. 33 needed of last two and Sreenath Arvind couldn’t do much against destructive Morkel as he leaked 21 runs, leaving just 12 to get in the final, and Morkel sealed it in style with the trademark six of the long on to seal the berth for finals in IPL 2011… CSK won the match by 6 wickets and 2 balls to spare…. RCB 175/4 in 20 overs. CSK 177/4 in 19.4 overs. – Raina hit the 600th six and 4th fifty of this season. – Suresh Raina is the only batsmen to go past 400 runs mark in all the seasons of IPL so far. – Virat Kohli’s is the third batsmen to go past 500 runs mark in this season. He is now with 514 runs. – Mike Hussey scored the first duck of this season. – CSK is the only team to enter finals 3 times in IPL; it will also be the first team to defend their title in the finals. – This is first time in the tournament that a match has ended with 2 balls to spare, surprise teams have been chasing so comfortably and how boring it have been all these days. – It’s 5th time in this season, that Ashwin has dismissed a batsmen right after hitting a six in his ball. Final day in IPL 4 for the league matches, as top four teams clash on an important day to decided their places in the top 4. Match 69, Chennai taking on RCB, whoever wins this game will take the top position without any chaos, over the result of the next match happening later in the day. Vettori won the toss and decided to field first, As expected tinge of green in the pitch did its job to seem and spin the ball in the beginning, which Chennai didn’t tackle for, so they lost 4 quick wickets for 22. Later two wicketkeeper batsmen joined in rescuing the Chennai, Apart from Saha, none seems to help Dhoni as he waged the lone battle to score his best score in the IPL. As CSK finished with 128/8 in 20 overs. RCB had one man to do the mission always, It’s Gayle and it is just him, with his unbeaten 75* he sealed the game for RCB. RCB will be hoping for someone to click other than Gayle, because we all know what happened against KXIP when he was dismissed for a duck. 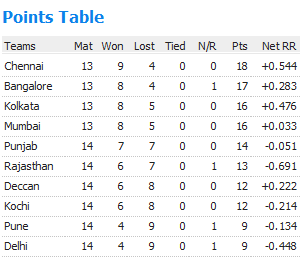 How ever RCB won this game with 8 wickets and 12 balls to spare and top the league chart with 19 points. For me, Match 1 and Match 70 were the best Match 1 started with 2 runs victory for CSK and Match 70 ended with a SIX to win for MI… Both the times Kolkata being in the receiving end unfortunately. – Gayle becomes the second batsmen after Shaun Marsh to break into 500 runs mark; he is now with 511 runs and the owner of Orange Cap. – Sachin became the fifth player to score 50 or more boundaries in this season of IPL. – This is second win for the Mumbai to finish in the last ball of the match pervious was with Rajasthan Royals when they were chasing 120. Along with this only team to win the games in the last ball of the match was them alone. – 23 runs chased in the last over is the highest ever scored while chasing to win the match for this season. 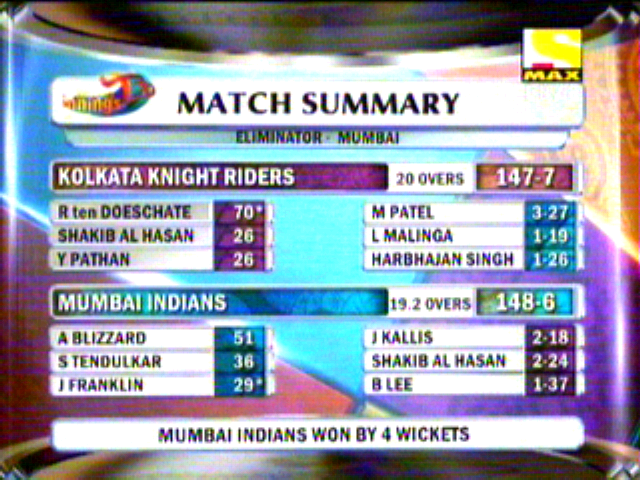 – This is 11th 8 wicket win happening in IPL this season so far, highest ever in any season. – Dhoni’s 70* runs is his personal highest, bettering 66 runs against Kolkata in IPL so far, this is also his second fifty in this tournament. – Badrinath scored his first duck for the season, he also became the first player to score duck after playing 10 deliveries, highest ever by any player in IPL so far. Match 64, Kochi take on Chennai in Chennai, which most team will not be willing, as none will be brave enough to face lion in his own den. If Dhoni wins the toss, he will Bat first and he was batting first today too. Hussey and Vijay started the things slow, but when Vijay wanted to accelerate a little he was yorkered by RP singh. Raina too perished on the same cause, when he wanted to hit Sreesanth for 3rd six of the over. After Badri’s departure, it time for longing Saha to make his point, who has been in the playing XI but had very little to do. Today he got the opportunity and he grabbed it with both hands and deliverd when needed, as he went on to make 46 valuable runs. His shots looked majestic for such a small guy. Whatta Talent he is… CSK finished with 152/5 in 20 overs. 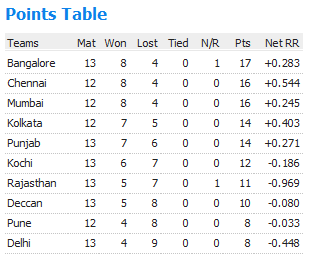 Needing a Big win for Kochi, atleast to keep the mathematically open for semi’s. Seems have forgotten the plans, cant say though as CSK bowled really well in the opening overs, You can say bowling was so good such that McCullum never went past the strike rate of 100 once in this innings and it was story for the rest to follow. Except Brad Hodge none looked in ease, even the effort of Hodge came too late as it wasn’t helpful in any means. Its Chennai’s Citadel and u can’t breach it easily. 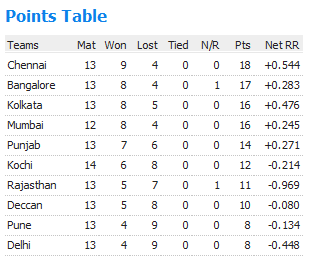 As Chennai won their straight 7th game in Chepauk with 11 runs. 1. Royal Challengers Bangalore 2. Chennai Super Kings, 3. Mumbai Indians. – For the second time in IPL, Two Indian Wicketkeeper takes position as opposition captains; first one was Dinesh Karthik Vs Dhoni. – Kochi Tusker Kerala now becomes the 4th team to be eliminated officially from IPL 4 and as well, Chennai Super Kings becomes the second team to be qualified. – Chennai Super Kings is the only team to have qualified for the play off’s in all the four seasons. 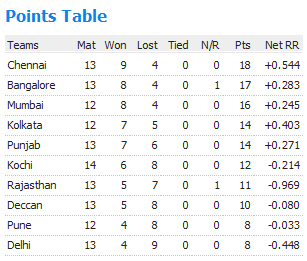 – Chennai wins all the home matches played till now for this season as record stands 7 out of 7. – Murali Vijay dropped his first catch of the tournament. – Brad Hodge scored his first fifty of this season. – Mike Hussey is the third player in the tournament to score 50 boundaries; the other two are Shewag and Valthaty. 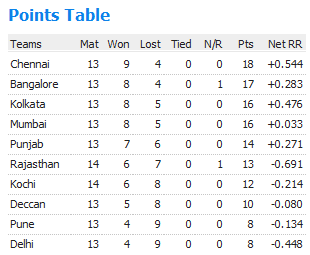 – Out of 9 games won by Chennai, 7 have been won batting first and just 2 in chasing. – Kochi Tuskers Kerala is the first team of this season to finish of all their 14 matches up front.